The wise men, or magi in the original Greek, are often represented as kings, but in context were likely astrologers. According to Matthew, they saw some astronomical event as a foretelling of Christ’s birth. There is debate among scholars as to the historical accuracy of event. Matthew is the only gospel that mentions the magi, and many scholars feel it’s a bit of pious allegory to show that the destiny of Jesus was written in the stars. But if we assume for the moment that Matthew’s account is accurate, it raises the question of what exactly the Star of Bethlehem could have been. 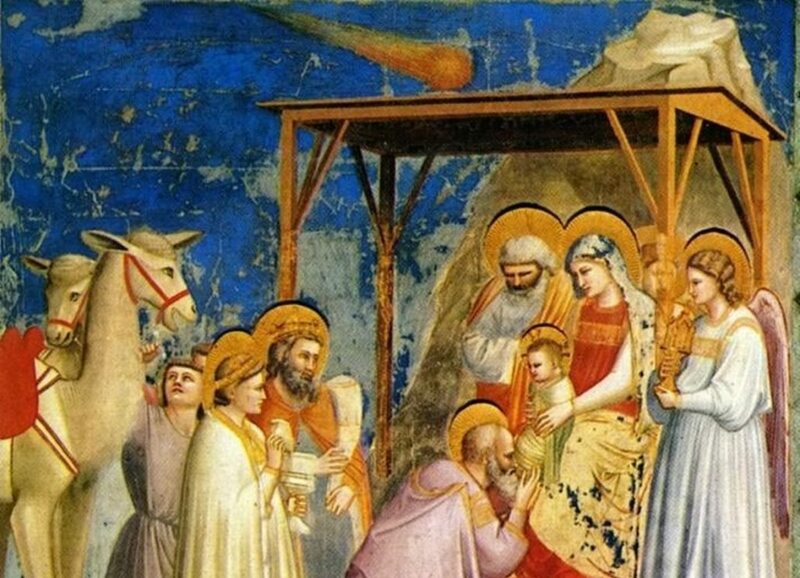 Adoration of the Magi, by Giotto (1266–1337), represents the Star of Bethlehem as a comet. 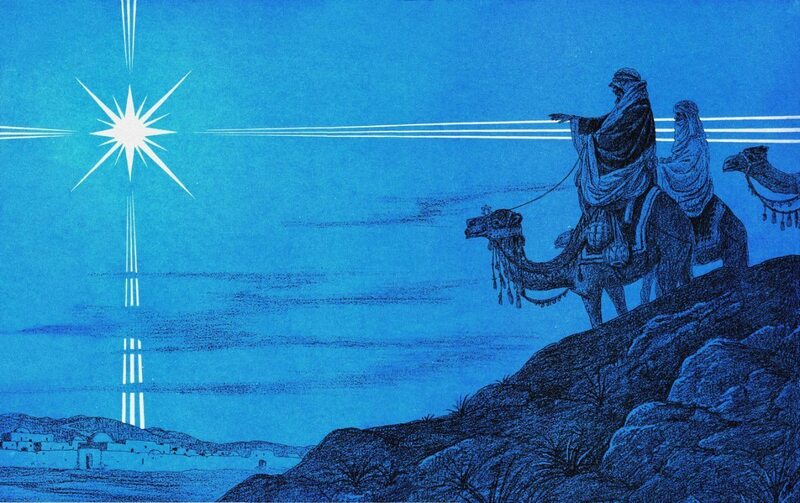 Another possibility is that the Star of Bethlehem was a comet. Bright comets do appear in the sky from time to time, and have been described as “hanging over” particular cities or lands, as the Star of Bethlehem is often represented. We know that Halley’s comet was visible in the region in 12 BC, and would have been bright enough to be described as a star. But the writers of Matthew would likely have known the difference between a comet and a star, and specifically noted the event as a star. There’s also the fact that comets were generally seen as bad omens, rather than good ones, so it would be unlikely that a comet would mark such an auspicious birth. A third possibility is that it could have been a nova or supernova. These appear in the sky as “new stars” and are sometimes brighter than even Venus or Jupiter in the night sky. This would match the Biblical description, and might have been interpreted an a good omen. Chinese and Korean astronomers noted the appearance of a nova in 5 BC, which would be around the right time frame, but this nova wasn’t noted by astronomers in other regions, so it likely wasn’t particularly bright. A truly bright nova or supernova, such as the one observed by Tycho Brahe in 1572, would have created a remnant that we could observe today, and there is no known remnant that can be dated to the time of Jesus. It’s possible that there could have been a supernova in the Andromeda galaxy or the Magellanic Clouds, but there is no astronomical record of such an event. More than anything else, this shows the problems of astrological prophesy. While there isn’t a single event that stands out as a clear origin to the Star of Bethlehem, there are lots of options that “kind of” fit after the fact. This is even true of the Gospel of Matthew itself. Matthew was written around 80 AD, decades after the events it describes, so the astronomical event it mentions would have been interpreted long after the Crucifixion and the rise of Christianity. Even if the author of Matthew felt the Star of Bethlehem was accurate history and not pious fiction, we’ll likely never know the particular event they had in mind. Paper: Chester, Craig. The Star of Bethlehem. Imprimis. December, 22(12) 1993. Astronomically speaking, and without any reference to controversy, there can be no doubt that the most remarkable conjunction of planets – that of Jupiter and Saturn in the constellation of Pices, which occurs only once in 800 years – did take place no less than three times in the year 747 a.u.c., or two years before the birth of Christ (in May, October and December). This conjunction is admitted by all astronomers. It was not only extraordinary, but presented the most brilliant spectacle in the night-sky, such as could not but attract the attention of all who watched the sidereal heavens, but especially of those who busied themselves with astrology. In the year following, that is, in 748 a.u.c., another planet, Mars, joined this conjunction. The merit of first discovering these facts – of which it is unnecessary here to present the literary history – belongs to the great Kepler.